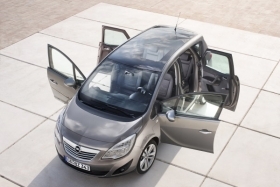 Opel says the Meriva's rear-hinged doors improve cabin accessibility. MUNICH -- Opel has revealed pictures of its Meriva compact minivan, which will be unveiled at the Geneva auto show on March 4. 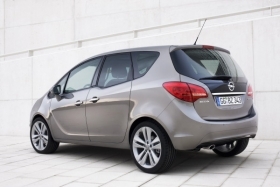 The new Meriva will have rear-hinged rear passenger doors that Opel says are a first for a volume manufacturer. A Meriva concept shown at the 2008 Geneva auto show had such doors but Opel had not confirmed until now that these would appear on the production version. The Rolls Royce Phantom and Ghost sedans and the Mazda RX8 also have rear-hinged doors but unlike those models, the Meriva's rear doors open independently without the need for an overlap by the front doors. Opel said the rear-hinged doors, which it calls FlexDoors, will improve accessibility to the rear cabin. “With the new Meriva, we wanted to engineer the new versatility champion in the automotive industry. I don't see any other car offering so many ideas that make one's life easier,” Alain Visser, Opel's head of sales and marketing, said in a statement. Opel launched the first generation Meriva in 2003 and has sold just over 1 million units in Europe. The Meriva is built in Zaragoza, Spain and the new generation is scheduled to go on sale starting in June. The new Meriva carries forward Opel's new sculptural design language also seen on the Insignia and Astra. It will be offered with six engines, which have fuel consumption reduced by an average of 15 percent compared with the current range.